Cryptic Brood – Official Webtomb - “Oscillating Brain” Tour 2018 – final route! “Oscillating Brain” Tour 2018 – final route! 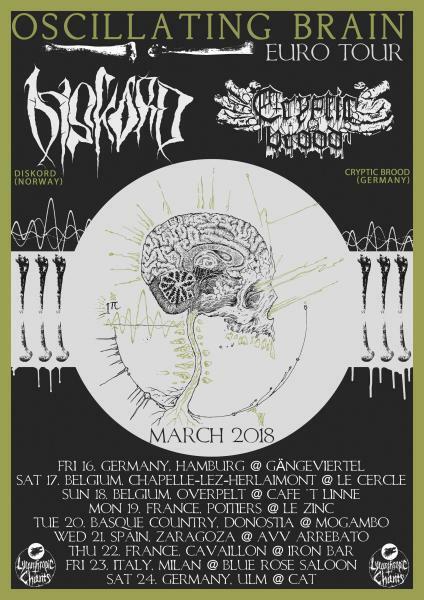 Lycanthropic Chants presents the “Oscillating Brain” tour that brings uncompromising and original death metal on a round trip through Europe in March 2018. The bands DISKORD (Norway) and CRYPTIC BROOD (Germany) promise to satisfy your ravaging death metal hunger, with music ranging from the very twisted and outlandish to pure lobotomy in putrid slime. A tour shirt is in the making. More info about that will be revealed on our website and social media soon. Artwork for poster and shirt by RK Valbo (OBLITERATION, SPECTRAL HAZE, VOID EATER).